My eyes hurt from crying. Face is bloated and puffy, and Rhubarb, my heart, is gone. I’ll write more soon. Had a long post ready to go, but the computer decided to die, and my soliloquy was gone, like the bunny that inspired it. A place where you could get something to eat after 9pm on a saturday night. Mark and I went to see Peter Singer talk about his new book “The Ethics of What We Eat” (note the different title of the US version of the book). After the talk we wandered to the Pitt Street Vegetarian Restaurant, to find that it had closed, so we went on to Wagamama, near Kinokuniya at Town Hall. They were just closing, but directed us to the Circualr Quay outlet. I wasn’t overly keen on the walk (having forgotten to grab a scarf on the way out), but there was nothing else that beckoned, so off we went. We arrived well before 10pm, to be told that they had taken last order 10 minutes earlier, and would we please bugger off. By this stage, the muttering under the breath became audible, and I apologise to any visitors to our fair city that were offended by my potty mouth. Still muttering, we made it back to the car in Pitt St (how many Weight Watchers points did I earn in that little excursion I wonder? ), and drove to Chinatown. The Purple Lotus Vegetarian was open, so we parked in the closest parking station, and hurried out. Or at least, we hurried around in circles. That place is a nightmare to get out of when your head is spinning with ethical questions, your nose is frozen, you are weak with hunger, and contemplating a move to New York, where even the Apple shops are open 24hours a day. Finally, we made it over the threshold of the restaurant. Yes, they were open, and allowed us to sit down. They even gave us menus, but they weren’t too sure about giving us tea. The waiter seemed anxious to take our order, to the point of warning us that the chef was keen to go home. Now, normally I would expect a certain amount of hostility from a waiter in a Chinese restaurant – it’s part of the charm, but tonight I was on the verge of a complete sense of humour bypass, and I may have been a teeny, tiny bit resentful. And then the food arrived. I have certainly eaten worse, but I had been told that this place was good, so the rubbery wontons in the watery and tasteless short soup were a bit of a disappointment. The san choy bow was just ordinary. The insult after the injury came when the cashier broke my change down into gold coins to make it easier for me to leave a tip. Author laranettlePosted on May 28, 2006 Categories The Life of LaraLeave a comment on Grrrrr……. I had a difficult start to the week. Work has been pretty horrid, for reasons I can’t make public, and I came home on monday night (after finding that the Club Lard Auditors had made a 1kg mistake a few weeks ago – I am not doing as well as I thought), to find that Rhubarb and Grasshopper had escaped from the Palais du Bun, and gone on a rampage. My birthday flowers had been eaten, the “cheer up” tulips from Mark had been knocked over, and the vase they were in ( a wedding present) aws in pieces on the floor. Bad Hare was desperate to try to get back home and pretend that it wasn’t him – Bad Bunny wanted dinner, and nipped me until he got it. I collapsed into bed, to find that it was somewhat damper, and more populated with bunny poo than I had left it in the morning. Yes, Rhubarb had paid a visit, and left a calling card. 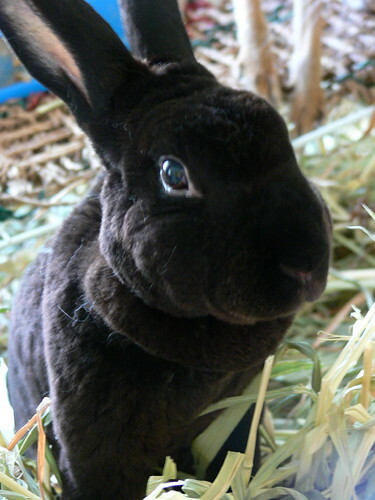 I tried to remember that pooping on something that smells like me is a bunny compliment, and I shouldn’t be offended. But tuesday I was going back to court, for what I had hoped would be the final installment of the Brendan McMahon experience. Every trip to court has been confronting and awful, but I had been lead to believe that there was a very good chance that the 23rd would be the end of it, one way or another, and I felt a little more hopeful and positive. It may not be a great outcome, but it’s an outcome – and I can move on. So on tuesday morning I met mum and the wonderful Jane outside the court, and we waited till 10.15 am for the court to become available. The defence solicitor seemed pretty hopeless, the prosecution appeared much more competent and prepared. Unfortunately, the judge now has to make a judgemnt on an interpretaion of law. The defence wants McMahon to be considered insane – that he didn’t know what he was doing was wrong, but the state would prefer that the case was considered under section 11a of the crimes act. If you’re a law student, or a lawyer, and can point me at the relevant documents, I’d be grateful. The long and the short of it – if the judge feels that the consideration of the “McNaughton Rule” (sp?) should come before section 11a of the crimes act, then the charges will be dismissed. Otherwise, there will be another court date for sentencing. There is no appropriate punishment for this horiffic crime. I can only hope that once it is over, I can find a way to give the events of the past year some meaning. And today, I learned that my dear friend Simone lost her cat Scooter overnight. He was eight years old, and healthy as can be until tuesday morning. He spent last night in an oxygen tent. He went into respiritory arrest and was revived 4 times, but they couldn’t save him. Please spare a thought for Simone, and her remaining cat, Maya, who doesn’t understand where her buddy has gone. Had a great day. Physio says he doesn’t need to see me any more (if I keep up my exercises), bought yarn, had lunch and shopped with Mum. Bought “Handknit Holidays”, but am sending it back – $60 is too much to pay for the one pattern I would knit from the book. But I am keeping the James Blunt CD. Tried my first home dyeing, the purple did not work out, but I am pretty happy so far – lets see how it knits up. I’ve been feeling a little poorly for a few days, but this morning my sore throat felt like it was closing up entirely – and I woke up to a very bad asthma attack. My asthma has been bad since the weather has become colder, and I’ve been careful to take my preventer religiously, knowing that if I don’t, I could end up in hospital, or worse. So today I’ve had a very quiet day. I’ve been feeling frustrated that I don’t get enough time for myself, for my knitting, photography, writing, gardening, and all the things that get forgotten in my busy life. So with a day off, I was feeling miserable that I wasn’t able to use my time constructively. I did a load of washing, and put the dishwasher on, but between the painkillers, the sudafed, and the vast amounts of ventolin I had to take to keep breathing, I was about as jittery and scattered as a frog in a blender. Which, as you know, is strongly against my deeply held beliefs. 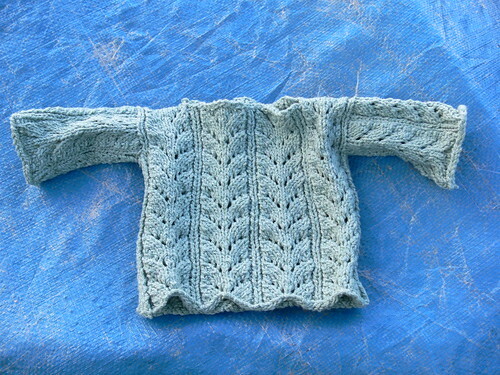 I finished the Surprise Jacket for little Lara on the weekend, and on monday I finished the Baby Fern Jumper. My dear friend Anna and her lovely husband are probably going through labour right now. On Saturday afternoon, she was 11 days overdue – and she was going to be induced today. I’ve got everything crossed, and am waiting with bated breath for an announcement. Anna and I shared a house in the early nineties, and without going into too much detail, we shared some turbulent times. I am very happy that she is back in my life, and more than a little touched that she and Rob are considering naming their baby daughter Lara. I knitted a fab blankie for them when I first learned they were having a baby. At that time, the baby was called “Boris Bump”. I am hoping to document the pattern properly, and perhaps even have the pattern published, so no pics yet. It’s pretty simple, but I think it’s the sort of thing I would have loved to knit as a newbie, so the Boris Blankie has to stay off the blog for now. But I took pics of the Baby Fern Jumper today, and decided that it would be a good exercise to try to write up the pattern properly. Knitting things from a pattern is one thing, but writing up a pattern other people can follow is a skill I haven’t attempted until today. So here it is, and here is a schematic. I’d love it if anyone actually wants to knit it, and if you do – and please send me any notes and corrections. Author laranettlePosted on May 2, 2006 Categories Knitting, The Life of Lara, Useful Things I did Today1 Comment on Sick!